The blossom abounds Bergen. I was rather impatient that it seemed to take forever to finally get the green light that spring had arrived (and thus we had the all clear that the eight month winter was finally over – still getting over the snow that graced us in May…), when suddenly, unexpectedly, the pink bloom of the cherry blossom and white bulbs on magnolia trees were abundant throughout the city. The sun shone and rain has been a stranger for almost two weeks! It has been, well, heavenly! I´m captivated by the beauty of the delicate petals on the branches, even the fluttering of the silky confetti to the ground is a wonder, the city has taken on a new persona and it´s almost unrecognisable! Joyful souls grin at each other, make casual conversation, and have removed a lot of clothing. I have no problem with any of the above, but it was quite a shock to witness, after the dark, furious winter season, those introverted and lonely desolate months spent inward, quiet and cosy. 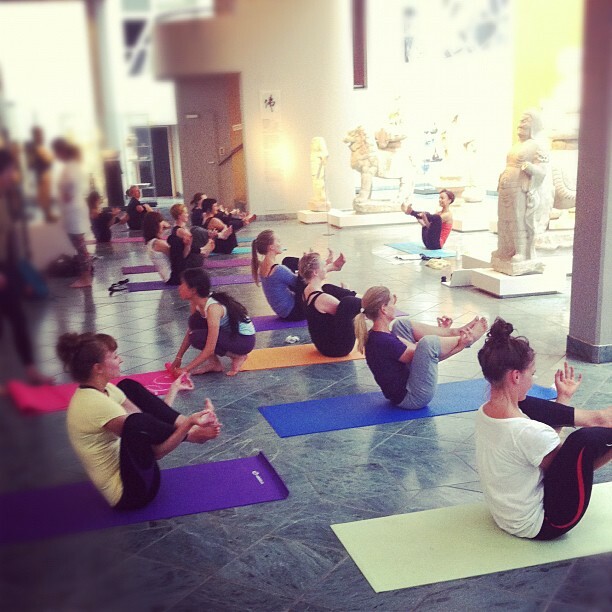 This week, we ventured into a new and wonderful territory for this week´s Art + Yoga class. I´d been looking forward to it for a year, since that moment i´d asked the receptionist to allow me to take a look at this mysterious room i´d glimpsed from the other side of the glass. They were generous to do so, and i sincerely believe that power of visualisation, luck and kindness of others allowed me the honour of holding our practice in such a mysterious and special location, amongst the Chinese art in Permanenten. After a fascinating lecture on some of the pieces we were sharing the space with, the sequence was inspired by the lotus flower. a symbolic and iconic icon in Indian, Japanese and Chinese traditions, this luminous plant emerges from muddy water and flowers for three days alone in conditions which seem impossible. Metaphorically, it represents beauty in the most challenging of situations, carrying light and hope forward from the murky darkness. Anatomically, we worked deep into the hips (chakras two and three), added twists to free energy in those areas and move it up the spine to release it. Many of us hold tension in the hips, particularly deep-rooted and unexpressed emotions, which can become stored in the body. Over time this manifests itself as physical tightness, stress and sometimes pain. We can use a variety of tools and notice ourselves, paying attention to every sensation, and become empowered by releasing them. We spent time working into pigeon variations, then took it into strong, hip opening standing postures before delving into mermaid and culminating with our blossoming into a lotus flower (Vikasitakamalasana). 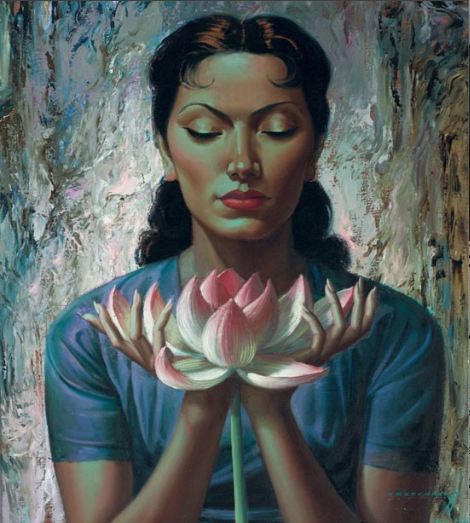 It was a journey that moved from deep within, and bloomed and expressed outwardly, a celebration of this new season. However although i have a lot of love for spring/summer, without that prior darkness, it wouldn´t nearly be appreciated as much. Admittedly, the winter can be hostile and challenging, but also beautifully nurturing. I am grateful for the time to retreat inward, to get up close and personal with myself (especially the bits i didn´t really want to get up close and personal with! ), for this has enabled me to make changes, retreat, salvage that much-needed energy, and (hopefully) move forward in growth. Now on the other side of that challenging season, i feel stronger, lighter and grateful for it. Time lurking in the dark is never wasted! So as opposed to shunning the darkness, perhaps trying to hide something we might not like, or wish things were different in some way, let us reach deep into the knots of guts, pull out the dark matter and plonk it on the table in all it´s finary and accept it for being a part of this sweet journey. We can embrace the darkness, as much as the light with equal importance. Here´s a playlist for your ears, with love! This entry was posted in #365yoga, art + yoga, inspiration, music, playlists, postures and tagged Bergen, lotus flower, mermaid pose, permanenten, Vikasitakamalasana, yoga. Bookmark the permalink. That is an amazingly diverse playlist, I love it (especially the J Dilla)!